Off road touring can present numerous potential hazards that ultimately leave travellers stranded in remote, hard to reach locations. Those who have suffered will know just how serious an issue it really can be. A punctured sump, a tail-shaft jammed with logs, or even a damaged radiator. A failure of this nature can be both very costly and worrying for those unlucky enough to be stranded without help. We have every base of design covered to ensure you have every chance of battling the outback and winning every time. By incorporating specific design features and utilising high grade materials, the following range of guards will protect you and your vehicle. Laser cut on high tech machinery, each guard is manufactured from 3mm aluminised steel with circular venting holes being protected from protrusion by 3mm steel mesh. 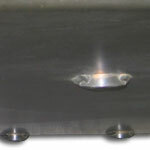 The guards are welded to Australian Standard AS - 1554. All guards come with full fitting kits where applicable, (if factory mounting bolts cannot be retained) and comprise of high tensile grade 8.8 fasteners for a true bolt on item. All guards incorporate several unique and important engineering design features, combining to deliver a superior product through years of testing and development. Often to fully protect vital cooling components, charge air flow would otherwise be affected, however strategically placed venting holes protected with 3mm steel mesh to ensure proper cooling efficiency is maintained for items like the radiator and intercooler. Although having a guard bolted up underneath the vehicle offers protection against object deflection, the bolt heads protruding from the guard on mount locations can pose a potential problem if not adequately protected themselves. Where possible, the bolts are recessed into the guard. Where this is not achievable, strategically welded shields are placed in front of bolt head locations, preventing damage and thus ensuring easy removal of the guard. One problem often encountered with other aftermarket guards is they forget to allow for tow hooks. These guards are designed to incorporate the factory tow hooks. On larger guards, long flat areas are carefully pressed with a 'X' pattern across the area to increase stiffness and rigidity of the guard. This improves the ability to deflect larger objects. 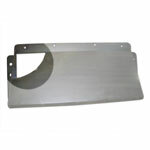 These guards consist of three main types, designed for specific applications and protection. 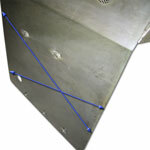 Some guards contain two or more of the below listed guard areas incorporated into the one design (model specific). 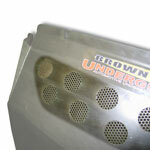 Where possible we also make every effort to ensure the most 'universal' of fitment to cater for most popular bull bars. Radiator guard Designed to protect the front of the vehicle against potential damage to vital cooling components like radiators and intercoolers. Where possible, guards are designed to slope at specific angles to act as a deflecting tool and also to help push any objects downwards and under the vehicle away from further damage. Steering guard Often incorporated into the front section guard. Steering protection is offered for some models where the steering rack and tie rods are susceptible to frontal impact damage. Sump guard Given with the vital task of protecting one of the most important aspects of the vehicles engine and thus reducing the risk of losing oil and causing severe engine damage. Transmission guard Mounted beneath the transmission (manual or automatic), the transmission guard protect against protrusions that may damage the transmission or tailshaft to transmission input.